Barcelona-based designer Victor Castanera transforms the grains of sand from Barcelonetta into gorgeous, sustainable tableware. Each piece in the Areniscos project is made without the use of machines or contaminants. The resulting bowls are beautiful, unique and entirely ecologically sound. Like building sand castles, Castanera’s process begins with simply pouring water on sand on the beach. Castanera lets nature dictate the bowl’s shape around the mold as it settles and eventually dries. After removing coral, chunky stones and other debris from the beach, an eco-friendly acrylic resin is poured into the mold to set the shape. Once the bowl is hardened, the bowl is carefully dug out of the sand on the beach. Like an archaeologist, Castanera then carefully brushes away the excess sand to reveal the set bowl. The organic method connects the craftsman directly with his process, making production easy to set up without the need for a factory or industry. Castanera finds his process just as important as the aesthetic of each piece, and users are reminded simply by looking at the surface of each. With each grain of sand still visible, the bowls remind the user of how each was made. 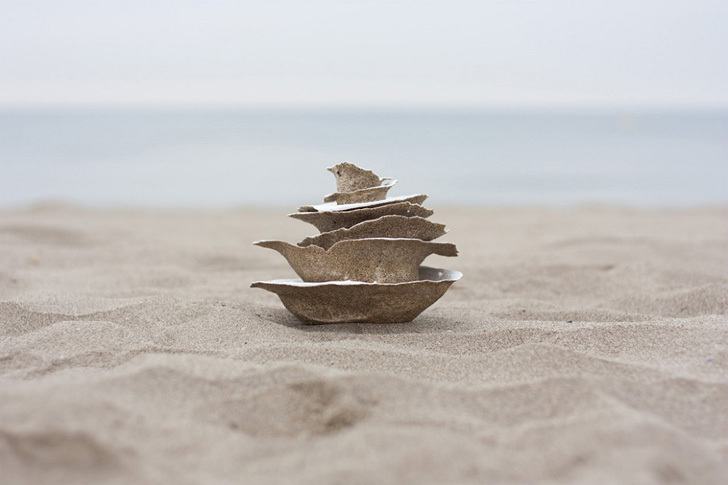 Castanera also makes plates, cups and trays using the same beach process. The pieces appear to be delicate, but are actually very durable thanks to the acrylic resin. Castanera’s Arenisco line return the fabrication process back into the hands of the designer. 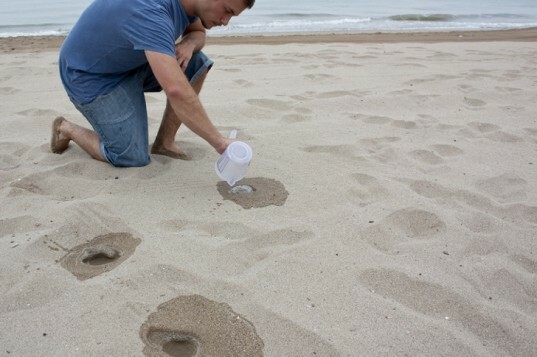 Like building sand castles, Castanera’s process begins with simply pouring water on sand on the beach. Castanera lets nature dictate the bowl’s shape around the mold as it settles and eventually dries. After removing coral, chunky stones and other debris from the beach, an eco-friendly acrylic resin is poured into the mold to set the shape. Once the bowl is hardened, the bowl is carefully dug out of the sand on the beach. Like an archaeologist, Castanera then carefully brushes away the excess sand to reveal the set bowl. The organic method connects the craftsman directly with his process, making production easy to set up without the need for a factory or industry. Castanera finds his process just as important as the aesthetic of each piece, and users are reminded simply by looking at the surface of each. With each grain of sand still visible, the bowls remind the user of how each was made. Castanera also makes loosely designed plates, cups and trays in his beach process. The pieces appear to be delicate, but are actually very durable thanks to the acrylic resin. Castanera’s Arenisco line return the fabrication process back into the hands of the designer.